"Ginger; known as 'The Universal Remedy' is analgesic, anti-inflammatory, anti-thrombotic (prevents blood clots), anti-depressant, anti-diarrhea (stops loose motions), and anti-oxidants. It is used for multiple symptoms like nausea, vomiting, headache, chest-pain, colds, stomach-pains, rheumatism, and nervous system disorder. " "The ginger gut flush is a combination of three key ingredients that work together to eliminate toxins. These ingredients increase the digestive fire, or agni, in your gut, which helps to break down toxins. This improves digestion, a critical starting point for improving your health. You can feel the increased heat in your gut within seconds of starting the gut flush." 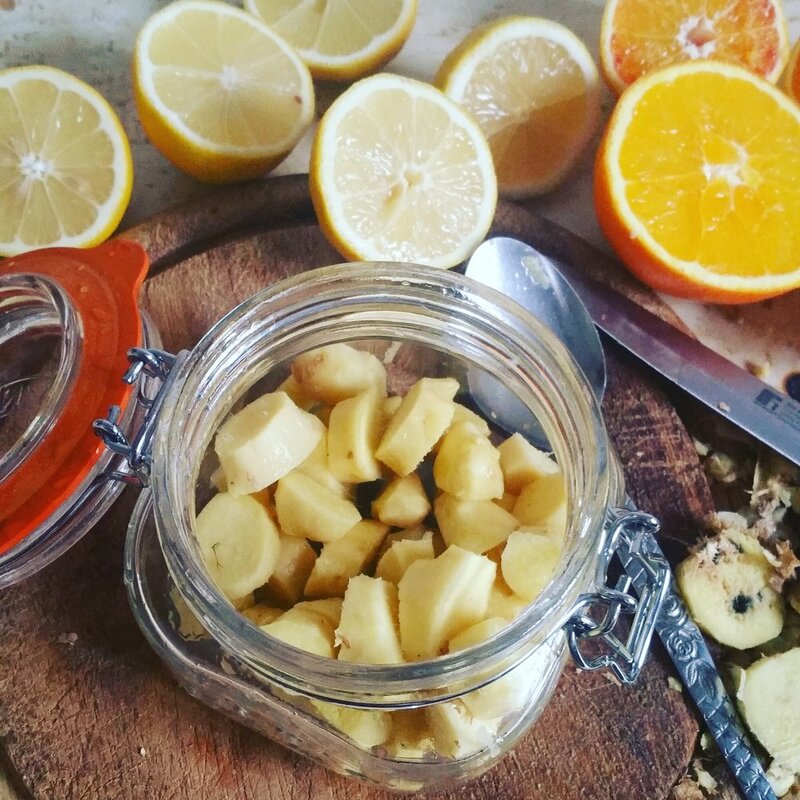 Choose a good airtight container like a kilner jar or similar. This recipe will keep you going for a couple of weeks depending on how often you eat one. I'd recommend one piece in the morning before you eat, and one before your evening meal. Peel the skin from your ginger. My good friend introduced me to both this recipe and a tip on peeling so since then I use the back of a spoon to remove the skin. You waste less of the flesh doing it this way and it's also very satisfying seeing the shape of the naked root still in tact at the end. Chop into 1cm x 1cm pieces and place in your jar. If you find ginger has a strong effect on your tum then chop into smaller pieces. Half and squeeze the juice from your lemons. I used a lime and an orange in mine too, as I had them in my fruit bowl and enjoy the taste. Add the salt. Stir it in well, close the lid and you're ready to go. I've made this mixture many times in the past year. In my experience it not only sorts my digestive system right out, it gives me an energy boost, stops me craving as many carbs and sugary foods, and brightens up my complexion. In the end I modified this batch as an experiment. Adding dried Turmeric (1 tsp), a sprinkle of ground Black Pepper and a Star Anise. Did I mention you can drink the juice too? People seem to love it or hate it. Either way, it's the best medicine I can recommend.